Hundreds of thousands of tourists visit Civitavecchia on the west coast of Italy every year, but few see anything of this port-city beyond the harbour, bus terminal or railway station. This is because the historic port has served as the port of Rome for around two millennia, and most are just keen to jump ashore from a cruise liner and head for the attractions of the Eternal City, situated about 50 miles (80km) away. 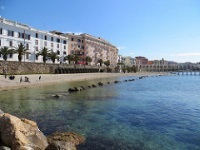 Those who are forced to kick their heels at a hotel in Civitavecchia for a night or two before embarking or after disembarking from a cruise will not find the city packed with much to see and do. Although it is an ancient port, most of the city's archaeological treasures and old buildings were destroyed during the two World Wars, thanks to its strategic importance as Rome's port. Travelling through the port gate, though, no one can avoid noticing the city's main attraction, the looming 16th-century Fort Michelangelo, commissioned by Pope Julius II and completed by Michelangelo. There are also remains of the old city walls, and a worthy fountain designed by Vanvitelli, close to the Fort and the old Roman harbour. The old part of town features another attractive fountain in the Piazza Leandra, fronting a medieval church. There is also an interesting National Archaeological Museum, which contains exhibits discovered during the harbour restorations and from surrounding archaeological sites. Along the wide seafront avenue stands the unusual Church of the Holy Japanese Martyrs, dedicated to some Franciscan monks who were martyred in Japan in the 16th century, and decorated with frescoes and mosaics by a Japanese artist. Along the adjacent coast are some enjoyable beaches and an interesting spa resort where the hot springs, known as the Taurine Baths, have been used since the days of Ancient Rome. We are looking for contributors for our Civitavecchia travel guide. If you are a local, a regular traveller to Civitavecchia or a travel professional with time to contribute and answer occasional forum questions, please contact us.